I had the privilege Tuesday night to participate in Steve Hargadon's "Future of Education" series of Elluminate [Blackboard/Collaborate] sessions. The session was an opportunity for a large group of educators to gather online and keep thinking, and that is extraordinarily valuable. You can watch/hear the entire event here. 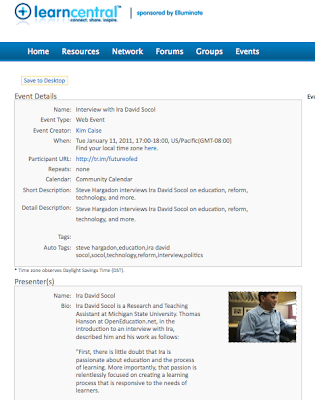 And you can look at previous conversations and put future conversations on your calendar here. The hour went very quickly, so quickly that we never even touched the SlideDeck (below), but that's OK. Good conversations never go as expected. Still, the slides might have reference value for those who want to dig further into some of the ideas discussed. View more presentations from Ira David Socol. What strikes me as important about this series is the openness of the conversation, as well as its global reach. So often, especially in the United States, education conversations are designed as one-way streets. From "the top" we hear proclamations, with all arguments ignored. Notice that in today's New York Times no opportunity is offered for readers to comment on Winnie Hu's puff piece for New Jersey's school budget slashing governor. So, as I think I remember saying Tuesday night (maybe in the conversation, maybe later on Twitter), step one is our ability to gather, to discuss, to doubt, to challenge, and to be together as we investigate how to do the best things for our students.